International Volunteer Day 2012 was two days ago (December 5th), but every day is a great day to celebrate the committment and hope for a better world that every act of volunteering represents. 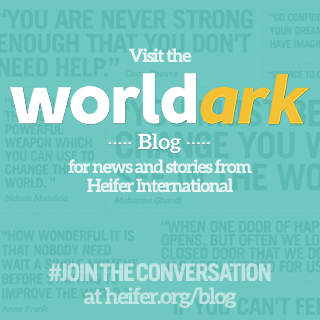 Heifer International's blog post on this event featured thoughts from Heifer Sacramento's very own Suzanne Awalt on her experience as a Heifer community volunteer. Go Suzanne! Coincidentally, the Heifer Sacramento group of volunteers gathered together on December 5th to share a meal and celebrate a great year of learning, collaboration, and committment to improve lives, empower communities, and care for the earth. We did indeed celebrate volunteerism on that day, even if it was just a coincidence! Cheers to all our fellow Heifer volunteers around the country and to everyone who gives their time and energy to make the world a better place! Keep up with all the good work! If you're interested in volunteering for Heifer International and are in the Sacramento area, drop us a line. We have a great group of volunteers and are making plans to do more to support Heifer International next year. 0 Response to "International Volunteer Day 2012"